He is the first tho. This little guy is my first attempt at a gnome, I consider him a partial success. Somebody asked me to make one, it took a while for me to find inspiration and here he is. 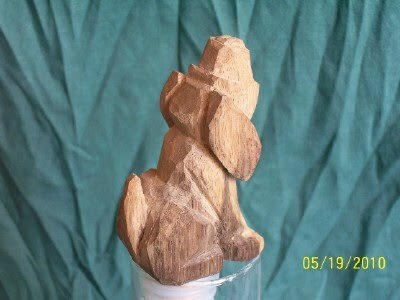 He's made from Paulownia, the first time I've used the wood. It has alternating rings of closed and open grain, unlike basswood or walnut, that took some getting used to. Its very soft, and very light. Goody from the Whittlers Porch introduced me to this wood. 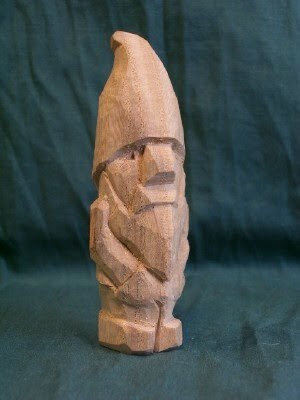 I am mostly happy with the gnome's head, the proportions worked out pretty good tho the execution is lacking a little. The eyes are weak, and not symmetrical, the beard and mustache are alos lacking symmetry. I also ran out of wood when it came to the body and feet, but plowed ahead anyway just for the experience. 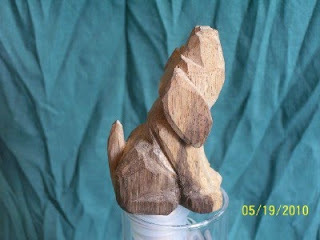 next time I'll start with a larger piece of wood, this one was 1" square by about 3-1/2" tall. he was much fatter in my mind, and a little taller. Next one will be closer to the one in my mind's eye. I debated his future, considered the burn barrel for a bit, but decided his good points outweigh his bad and so he has a home for as long as he'd like to stay. I'd like to try finishing this wood too, prolly tung oil on this guy, we'll see how much he absorbs and what the grain looks like too. 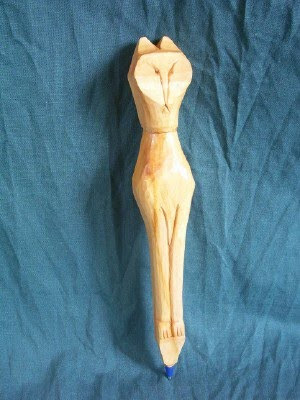 Here's another pen I finished recently, a stylized cat headed to the great state of Texas. Like the bee, the figure actually is the pen, the Octopus and the dog were more or less perched on the end of the pen, if you get my drift. Look back at the pics and you'll see what I mean. I hav another vision for this one originally, it just didn't work out and ended up in the burn barrel before I was half done. I guess the message is just do it, don't be afraid of making mistakes. That's how we learn, right? Yellow cedar, 7.5 inches, 2 coats of shellac. So I decided to practice my Flat Plane whittling some more, this little figure is one I've thought about whittling for many years, even when I wasn't whittling it was in the back of my mind to do. The light color is the sap side of the tree- walnut does not darken up until it is a few years old in the tree. in this tree the outside 2 inches or so (the tree was easy 2' diameter) is lighter and tan. The first two pics show the beginning of the heartwood, the darker streaks at the bottom. He's the second stopper I made, the first (frog) I finished with acrylic paints and water based urethane. I'm certain the frog will hold up for quite a long while, with care, but am also certain I'll eventually need to repair the finish. My wife has that one, so that's not really a problem. For the hound I tried something different, Minwax (not the only mfr) makes a product they call Wood Hardener, its a nasty cocktail of ketones and acetone and some sort of plastic or acrylic resin. It is supposed to penetrate pretty far, its intended to repair rotten or damaged wood so you can get a good solid base for filling and painting. I immersed doggie in a bottle, cover on, and still outside (one review I read suggested staying 7 miles from any open flame source) until the little air bubbles stopped coming out of him. That took about an hour, and another couple hours to dry enough to bring inside. Within a day I can't detect the scent of any solvents, even when I inhale the little guy, so I figure he's pretty well cured. 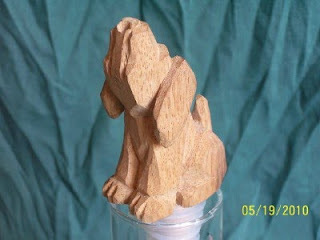 I ran him under the faucet, water seems to bead up and not penetrate, so it looks like I got what I want, so far- a durable protective finish that enhances the grain of the piece without adding color, and will stand up to careful rinsing needed by a working- dog bottle stopper.